The news media is abuzz about Malala Yousafzai, one of the contenders for the Nobel Peace Prize (to be announced tomorrow morning). I had never heard of her until I saw her earlier this week on The Daily Show. It’s probably a testimony to our times (and perhaps to my self-centeredness) that I get some of my news from the Comedy Channel (but in my defense, I get enough of my news elsewhere that I actually get all of Jon Stewart’s jokes). Just in case you’re as oblivious as I was, Yousafzai is a 16-year-old Pakistani girl who was shot — in the face — by the Taliban for speaking up about the importance of education for girls. Her memoir, ” I Am Malala: The Girl Who Stood Up For Education and Was Shot by the Taliban” came out this week. Sixteen! A memoir! She’s a blogger, too. All the talk about Yousafzai got me thinking about my own education, infinitely easier for me to attain. Without school, I might never have learned to read (I love to read!). 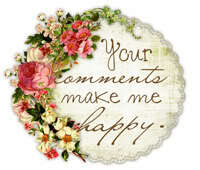 I would never have experienced the joy of expression in writing (oh, the horror that would be). I wouldn’t be able to add, subtract, multiply and do simply accounting (my husband would have had to find a new CFO for his insurance business). Without that class in basic keyboarding long ago, I might never have been introduced to Microsoft Word, Excel, Quark XPress and QuickBooks, all programs that have opened doors to creativity and ordered thinking. Like Yousafzai, I had supportive parents. I remember telling my father I wanted to be president one day, and he didn’t scoff at my aspirations (he teased, but he didn’t scoff). I really believed I could be president. I doubt, however, that I ever would had the guts to advocate for an education facing the point of a gun, and certainly not at age 15. Thank goodness for the women (and men) who made my education possible. Even if she doesn’t get the Peace Prize and despite my late coming to her party, Yousafzai has earned her notoriety. Good for her. 1.There are two locations with the address of 214 20th St. North in Birmingham, Ala. The first one the Garmin brought us to was a domicile, not a trendy lunch spot. The Brick & Tin, it turns out, is located in downtown Birmingham, and the purveyors believe “people should know where their food comes from.” We enjoyed both delicious soups of the day: Butternut squash and cauliflower. And I just love a place that serves couscous. Today’s seasonal side was a tasty couscous with roasted squash. 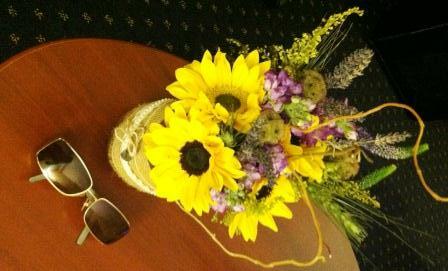 If you love this bouquet, pin it on Pinterest and talk up my friend Denise. 3. It’s the season of “yes” at Victoria’s Secret. After racing to a local mall at 8:45 p.m. tonight during the Bears game on Monday Night Football (!) only to find I’d forgotten my coupons (double !! ), the Victoria’s Secret associate told me I could return tomorrow and use the coupons even though they expire today. Hey, the coupons are for free underwear! Whew. I invoke this quote from Pierre Corneille, a French playwright, to compel you to believe it is your duty to watch Mitt Romney’s nomination acceptance speech tonight at the Republican National Convention. If it was already on your evening schedule, this post is not for you. Mitt Romney is the Republicans’ candidate for president. A six-word resumé for him would be this: High-powered businessman, former governor, multi-millionaire, Mormon. The back story: Romney, who battled it out in the most exciting Republican primary elections in ages, is running against Democrat Barack Obama, who is attempting to secure a second term as president. The election is in 67 short days on Nov. 6. I completely understand why you think your vote doesn’t matter or why you might believe all politicians are greedy and deceitful or why politics is more boring than watching paint dry. But I think voting is a privilege and a duty of being an American, and if you’re going to vote, you really ought to be informed. A lot of other campaigns may be boring and not worth watching (such as the one for village clerk or state representative), but determining who the man who becomes president of the United States is important. Who is in charge might not make any difference in the country’s direction, but I’m with Corneille: Do your duty, and leave the rest to heaven. Watching Obama’s speech next Thursday. Watching at least part of one presidential debate. This is not too much to ask in return for the American infrastructure and freedoms you enjoy every day. Thirty years ago, I was learning to drive. After our trip to California, I had to start behind-the-wheel right away. The first day I went, I was dressed in loose Chic jeans, an old shirt of Mom’s and my hair wasn’t curled or anything — it was straight and in barrettes. I didn’t look good at all and you’ll never guess who I had the unfortune of having it with: [name deleted to protect the innocent — for the purposes of this blog post, we’ll call him Reeve], Mr. Perfect — almost tall, beautiful hair, a super athlete and rich. The next day, I curled my hair and looked halfway decent but of course I couldn’t make any conversation, I was just so nervous. Anyone else remember Chic jeans? Misfortune, anyone? Right around that time, I bought some skin-tight Gloria Vanderbilt jeans — those were a lot more fashionable. At least in Wadena. Mr. Polloch, the instructor tried making conversation with us while we were driving but I couldn’t talk and drive at the same time. Reeve could though. Just from listening I learned that Reeve went to France by himself and visited an old friend. That French people smell. French movies are very expensive, and that he went on a bike trip while he was there. I learned that he has a cabin on Pine Lake, eats Cheerios for breakfast and has a huge boat. Lots more, too, but some I don’t remember and some is trivial. Like “Cheerios for breakfast” isn’t trivial? One Friday, I had to take a test. I was so nervous I couldn’t eat breakfast. I passed though, with an 81. Reeve got a 92 or 94 (he can even drive!). Some lessons need to be learned over and over again. For me, it’s not driving I need to learn (while my Beloved thinks I drive like an old lady, I will point out the only real accident in which I’ve been involved was caused by someone else –Dad, I’m not counting the garage door). No, the lesson I can’t seem to get through my head is that learning oftentimes means not knowing what to do and sometimes means failing. It’s a serious character defect that I fear failure so much it paralyzes me. I’ve spent the past week formatting my memoir for publication, and I’ve learned more about Microsoft Word and e-publications than I have time (or you’d have interest) to recount. I’ve spent weeks (months? some might say years?) fidgeting in my seat and dragging my feet and (and other metaphors for procrastinating), thinking I could figure out self-publishing by reading about it. Nope, it requires experiential learning. Just like learning to drive. Every year about this time, I have to force myself to walk past the school supplies displays that dot the Big Box stores I frequent. This year, I succumbed to the undeniably colorful lure of a new box of crayons. I bought a box for my 8-year-old nephew. 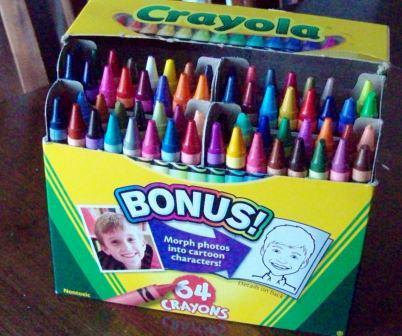 Not only did the box have such delights as mauvelous and wild strawberry, it had a bonus: A free invitation to Crayola’s StoryStudio which promised to convert photo portraits into cartoon characters. The project kept my nephew occupied for about five minutes, which isn’t bad for a toy you can’t plug in, but it seems you get what you pay for. The free StoryStudio didn’t really turn a photo into a cartoon — it offered a catalog of attributes (eyes, eyebrows, mouths, chins) to puzzle together into a character that looks sort of like you. I’ve always said I had cartoon-like eyes. Here’s the proof. 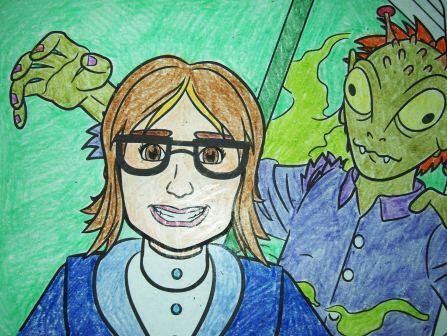 This is what I got in the Haunted House storyline — me, about to be nabbed by a scary alien. Not to give away the ending to the coloring book, but the alien turned out to be a not-so-scary friend in costume at a Halloween party. Do not ask me what the yellow green vapor is. It wasn’t identified in the story. That’s probably the scariest part. Author Andrew Delbanco appeared on National Public Radio’s Diane Rehm show this morning, and I found the conversation to be interesting, especially in light of the fact that I’m stepmother to a high school senior who is pondering his next move. How do I live an honorable life? How do I choose between conflicting loyalties? What’s the best way to come to terms with my mortality? What do I owe to my children, what do they owe to me? “Conflicting loyalties” and “what do I owe to my children” — especially tough ones for us in middle age. How do you answer those questions? And, if you’re college educated, how is that education helping you answer them? With seasonal poetry, a fish story and a description of a trip to Epcot, “All About Me” is filled with great reading. All of it written and illustrated by my 12-year-old nephew, Drew. He’s an author, and I’m lucky enough to be a recipient of a copy of his book. In a stroke of teacher genius that impresses the aspiring author in me rather than makes me yearn for the good ol’ days, the students in my nephew’s class each created a book over the course of the past school year and had it published. Any books I created back in the day were made with construction paper and yarn. His is full-color and perfect bound.